During the Tuesday evening rush hour, dozens of bicyclists laid down their rides in a brief, silent protest around H and 3rd streets in Northeast D.C.
WASHINGTON — During the Tuesday evening rush hour, dozens of bicyclists laid down their rides in a brief, silent protest around H and 3rd streets in Northeast D.C.
“We’re out here today to honor the memory of Malik Habib. He was 19 years old,” said Rachel Maisler, Ward 4 representative in the Bicycle Advisory Council to the District’s government. The fatal crash happened June 23. A so-called ghost bike painted white and decorated with a bouquet of flowers marks the spot where Habib died. 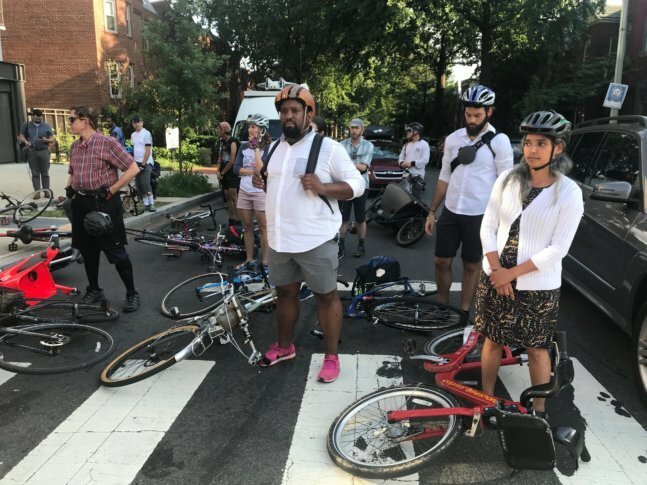 “We’ve seen a lot of very bad accidents on H Street, in particular in the past few months, and there needs to be more work done on the part of the D.C. government to enforce the traffic laws we have and make streets safer,” said Karen Ramsey, an avid bicyclist who lives in the Trinidad neighborhood. During the short memorial and protest, car horns honked and a few drivers cursed as they saw the crowd of bicyclists causing the momentary slow down. While memorializing Habib, the bicyclists called for safety improvements on the busy thoroughfare where cars and trucks mix with interstate and city buses in addition to the DC Streetcar. Though it’s a risky ride on the busy roadway, it’s not always possible for neighborhood bicyclists to avoid the crowded street, the riders said. “Even though biking is not recommended on H Street, you still have that last block, that last two blocks, where even if you come up a side street, you need to get to your final destination,” Ramsey said. The bicyclists want stepped up speed enforcement.